Let's walk through hitstorical towns, rural villages and nature with our tour guides! 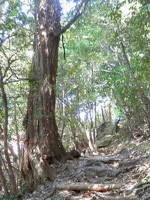 Mount Gozaisho is a 1,212 meter high mountain which is located in the Suzuka Quasi-National Park. The four seasons of the year can be enjoyed here. The azaleas and cherry blossoms in spring, the cool breeze during the evening time and red dragonflies at summer, the red maple leaves in autumn, and the frost-covered trees and skiing from the hill top during the winter. It is called the "Ochobo-san" among the local people. 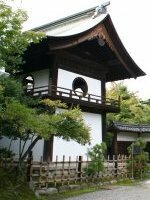 The shrine was built in the Muromachi period (1336 to 1573) by Mori Hakkai who belongs to a baronial family, with an intention to maintain the ancestors' spirits for over thousand years. 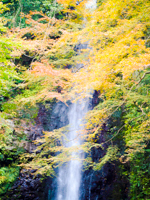 The legendary "Yoro-no-taki Fall" is located in a 30 minute-driving distance, which is also a popular sightseeing and hiking spot. 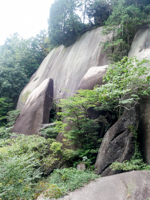 If you like, you can walk from Tsumago to Magome or vice versa. 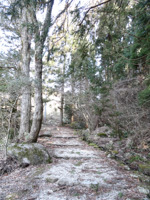 Part of the Nakasendo Way remains exactly the same way it was in the old days. Slip back in the times of the Edo period. 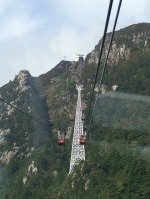 Total length of the hiking course is 9 kilometers, and would take around 3 hours to complete. 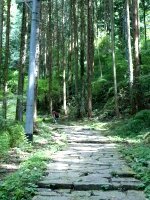 It is easier to walk from Magome to Tsumago.